Summer has officially started for me. Yes, the weather is hot, it’s raining, there are typhoons every week, yadda yadda yadda. That’s not it. For me, THE sign of summer are the many animated features that hit the HK cinemas. Yes, I am a closet cartoon queen. I love them, well most of them anyway. I can’t profess to having a real strong appetite for Tim Burton’s black and white masterpieces. I like my cartoon characters cure and chubby; not angular. And I love the minions. Yup,summer opened for me with Despicable Me 2. OK, plotwise (what? Looking for a plot in a cartoon?!!) the first movie was much better. There’s nothing like a villain realising the errors of his way and turning over a new leaf, after all. But this has enough fun and laughs to keep me engaged – and it’s a nice, simple love story. Awwww Gru”s all grown up and has a love interest! 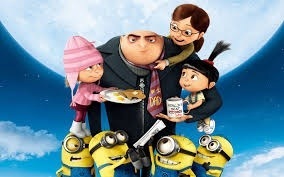 Gru, who’s now working on starting a little business in jams and jellies (I have a few FB friends who can help here), is recruited by the Anti-Villains League to find the serum for a deadly serum that turns animals/people into mindless killing machines and bring the dastardly villain to justice. He’s paired with the quirky Lucy, who’s more effective than she appears to be. Gru’s gut feeling tells him it is El Macho, who was supposed to have been killed in a volcano explosion years ago. El Macho hires Dr Nefario who’s grown tired of the sickly sweet business of jellies, and kidnaps Gru’s minions to start his army of purple killing machines. But I think the best part of Despicable Me 2 is watching the silly minions and they just enjoy the the little things in life no matter how trivial ot stupid: gelato, smacking each other, rolling around in the grass. It’s what childhoods are made of and it’s what some of us could do with a lot more in this stressful world. Is Despicable Me 2 the most brilliant animated feature ever? No. But it certainly made me happier and a little more stress-free when I left the cinema. For that, thank you, Illumination Entertainment. I’ll be waiting for Part 3! I was going to post a review of Monsters University after I saw it but it was so disappointing that I can’t work up the energy. It was rather bleahhh actually, nothing much to the story, hardly any laughs and nary a heartstring was tugged.